Once again Absolute Web Services will be bringing you a 3-part series of comparative, FULL, reviews! Our previous take was on Ecommerce platforms where we reviewed Magento, WooCommerce, and Shopify. This time around we is tackling email marketing platforms which for online stores is extremely important! 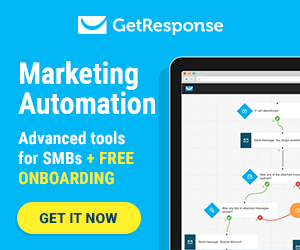 We will be reviewing Mail Chimp, Constant Contact, and Klaviyo. Today we are going to start with discussing Klaviyo. 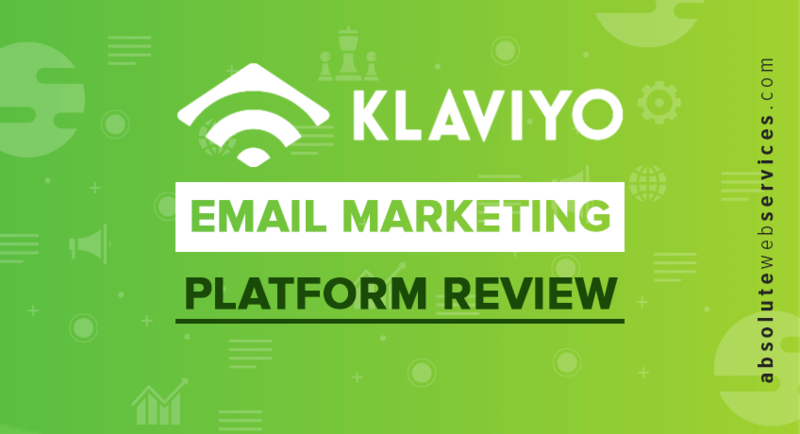 Before we dive into the particulars, I want to say that Klaviyo is amazingly integrated with your ECommerce platform, but you may find that it has significant growth opportunities as a stand-alone email marketing platform. First off let’s talk about the features! 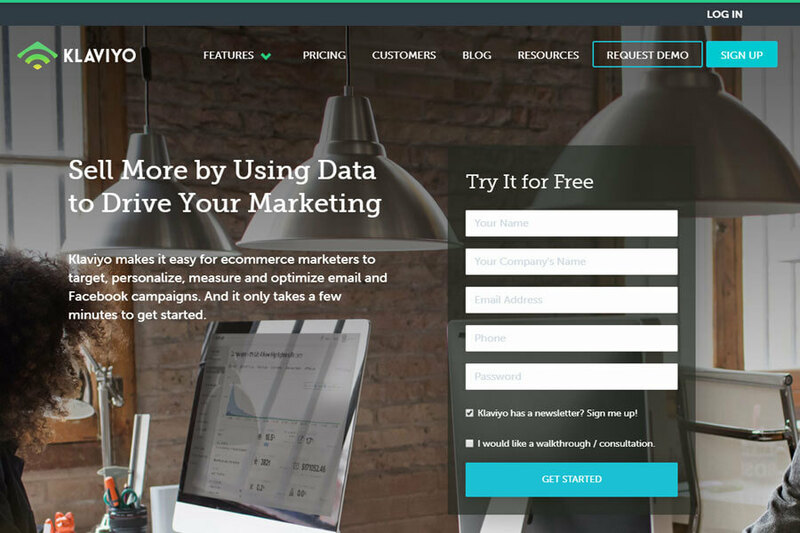 Using data to drive your marketing delivers better results.” Klaviyo does deliver on this promise being a data driven platform that integrates seamlessly with your ECommerce platform. What else is under the hood? Klaviyo, like its competitors, has an open API and come with available plugins/applications to seamlessly integrate with your ECommerce platform. 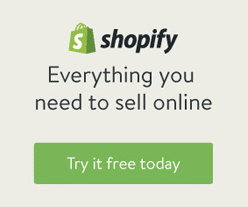 Klaviyo has available bridges for Shopify, Shopify Plus, Magento, and WooCommerce, amongst others! Their ability to pull data like user flow to support trigger emails is quite impressive and may very well be best in class. In addition, Klaviyo has integration support for several payment software, helpdesk, CRM, and much more. Lastly, the Klaviyo API is very well documented and for an experienced developer integrating with a homegrown system is not an impossible task. I really love the email designer from Klaviyo. The setup wizard allows you to set brand colors and fonts that automatically apply to built-in work flows and any new template you create. Klaviyo provides pre-built layouts that you can easily customize. For the advanced users, they feature an HTML builder/uploader for designs requires more development power. Klaviyo has a powerful email designer/editor system. Klaviyo definitely delivers here and is best in class. Powerful software doesn’t have to be difficult to use – that’s what makes Ecommerce workflows in Klaviyo most impressive. 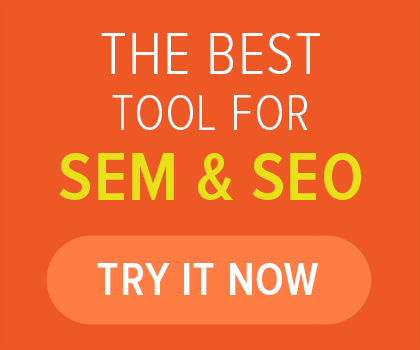 You can turn on the optimized abandon cart series and see your sales go up. Make the most of existing customers with post-purchase email series that include win-backs, product review requests, and friend referrals. And take advantage of your opportunity to make a great first impression with a welcome series for new subscribers that lets you segment based on purchase history, browsing behavior, and email engagement. This is all aided by Klaviyo’s impressive tracking integration for the triggered emails. Klaviyo absolutely nailed work flows and triggered emails. Klaviyo matches other providers here with the ability to label lists, segment based on purchasing history, and import from other email providers. Klaviyo, like Mail Chimp, provides a very easy to use platform for column matching. Overall, Klaviyo is adequate but certainly nothing revolutionary. In addition, Klaviyo offers standard pop-up, site embed, and hosted sign up forms for the acquisition of new subscribers. Here is another area where Klaviyo shines! Klaviyo does Ecommerce/customer integration so well that it allows you to add dynamic content right into your workflows. You can add blocks for order details, cart contents, product recommendations based on previous purchases, and custom web feeds. This level of dynamic content support is unrivalled. 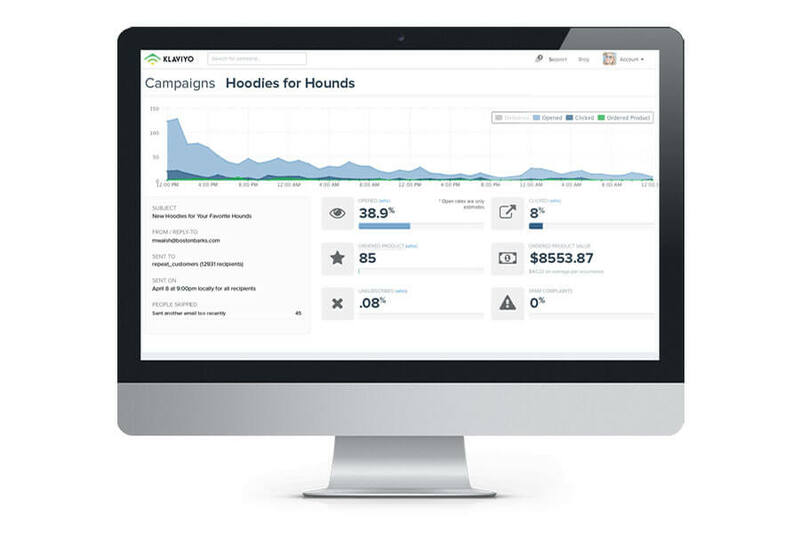 Klaviy has recently joined Mail Chimp with direct integration to Facebook Ads. It allows you to broadcast ads to opted-in emails on Facebook. However, it does have some way to go to match Mail Chimp. The system feels cumbersome, and we still prefer using business manager and segment via the desired demo. 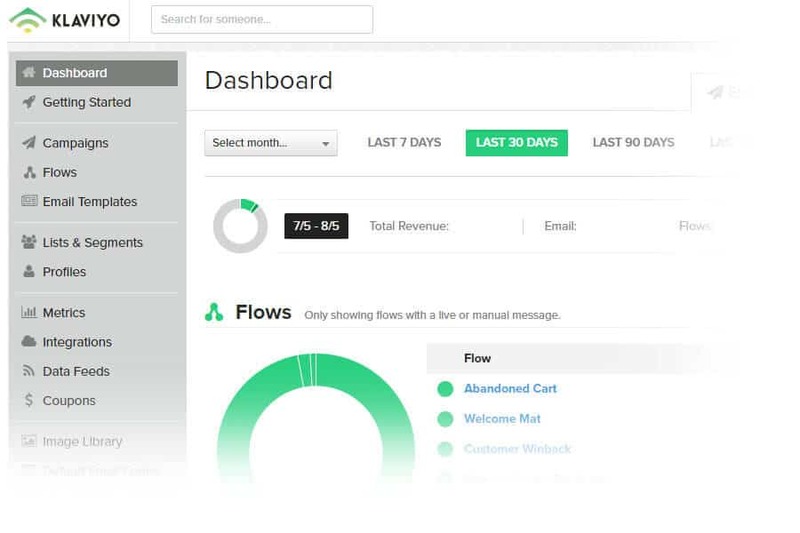 With Klaviyo, you get the segmented email reporting you would expect from any marketing platform. There is one added benefit Klaviyo provides transactional history due to its impressive integrating capabilities with your ECommerce platform. Klaviyo is not cheap and like most providers pricing ranges on contacts. Let’s talk about this for a second. Up to 149,00 contacts will set you back $1,700.00 a month while up to 250 contact is FREE… Yes, free. I understand that’s a pretty aggressive range, but if you look at it from a per contact metric, Klaviyo is on the upper end of email marketing platforms. If you are not a store owner, you might find the true magic of Klaviyo to be missing. Klaviyo is an awesome add-on for your ECommerce platform and really enables Klaviyo best features like work flow, triggered emails, and transactional reporting to outshine its competitors. We give Klaviyo a 5/5 for STORE OWNERS and a 3/5 for non-transactional websites. You can start your free trial by clicking here. Nice article! This collection is just great listing of blogs and website to follow for the web developers These kind of article are really helpful to increase the knowledge about best web designing and development services ..Thanks for writing this insightful article.